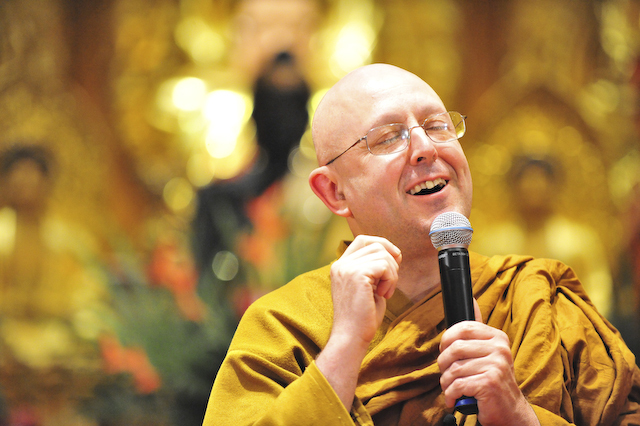 I stumbled up on this beautifully written article today by Ajahn Brahm. I hope you will enjoy reading it as much as I did. The Buddha’s word for loving-kindness is metta. It refers to an emotion, to that feeling of goodwill that can sustain thoughts wishing happiness for another, and that is willing to forgive any fault. My favorite expression of metta is encompassed by the words “the door of my heart is fully open to you, forever, whoever you are and whatever you have done.” Metta is love without a self, arising from inspiration, expecting nothing back in return, and without any conditions. The Buddha compared metta to a mother’s love for her child (Sn 149). A mother might not always like her child or agree with everything it does, but she will always care for her child and wish it only happiness. Such an open-hearted, non-discriminating, and liberating kindness is metta. In metta meditation you focus your attention on the feeling of loving-kindness, developing that delightful emotion until it fills the whole mind. The way this is achieved can be compared to the way you light a campfire. You start with paper or anything else that is easy to light. Then you add kindling, small twigs, or strips of wood. When the kindling is on fire you add thicker pieces of wood, and after a time the thick logs. Once the fire is roaring and very hot, you can even put on wet and sappy logs and they are soon alight. Metta can accurately be compared with a warm and radiant fire burning in your heart. You cannot expect to light the fire of loving-kindness by starting with a difficult object, no more than you can expect to light a campfire by striking a match under a thick log. So do not begin metta meditation by spreading metta to yourself or to an enemy. Instead begin by spreading loving-kindness to something that is easy to ignite with loving-kindness. At the end of the mental exercise, my eyes still closed, I focus the attention on the region around my heart and feel the first warm glow of the emotion of loving-kindness. My kitten is like the paper that you use to start the campfire. You may not like kittens so choose something else. Whatever you choose as your first object of metta, make it an imaginary being and not a real one. “Dearest friend, I sincerely wish you happiness. May your body be free from pain and your mind find contentment. I give you my love with no conditions. I’ll always be there for you. You will always have a place in my heart. I truly care for you.” – or similar words of your own design. Use whatever phrases arouse the warm glow of metta in your heart. Stay with this person. Imagine they are right before you until the metta grows bright and constant around them. Now briefly place your attention on your body near your heart and feel the physical sensation associated with metta. You will find it feels delightful. Let go of the image of that person and substitute that of another close acquaintance, creating the feeling of metta around them by using your inner speech in the same way: “May you live in happiness …” Imagine them right before you until the metta glows bright and constant around them. See if you can imagine metta to be a golden radiance emanating from a beautiful white lotus flower in the middle of your heart. Allow that radiance of loving-kindness to expand in all directions, embracing more and more living beings until it becomes boundless, filling up all that you can imagine. “May all living beings, near or far, great or small, be happy and at peace ….” Bathe the whole universe in the warmth of the golden light of loving-kindness. Stay there for a while. When the fire of metta burns strong, nothing can withstand it. Next, there is one final “wet and sappy stick” to be tossed into the fire of metta. Most meditators find that the hardest person to give loving-kindness to … is themselves. Invent your own words here to let the warmth of loving-kindness sink deep inside of you, to the part that is most frightened. Let it melt all resistance until you are at one with metta, unlimited loving-kindness, like a mother’s care for her child. Before you end the metta meditation, pause for a minute or two and reflect on how you feel inside. Notice the effect that this meditation has had on you. Metta meditation can produce heavenly bliss. Metta meditation softens the mind and turns it toward care, goodwill, and acceptance. You become more selfless, less concerned with your own needs and more willing to peacefully interact with others. The emotion that is metta feels delightful and pure. As you develop it repeatedly, it soon remains constant in your heart. You become a compassionate person, and your kindness is a source of joy to all beings and to yourself. Metta enables you to embrace another being just as they are. Most people find this impossible because of their faultfinding mind. They only see part of the whole, the part that is flawed, and refuse to accept it. Loving-kindness, on the other hand, embraces the wholeness of something and accepts it as it is. Through the practice of metta meditation, you find yourself becoming less conscious of the faults in yourself and other beings, and more able to embrace them just the way they are. This ability to see the beauty in an object and ignore its flaws is a powerful aid to all types of meditation. ← I’m better than you!